For dear plant lovers, if you always go out, if you are always off on business, holiday, vacation, if you are not good at growing plants with soil, you must choose our Vacation Plant Watering Devices. Celover Self Plant Watering Spikes, made from high quality ceramic, release water properly, which saves your time and brings you a carefree travel. Believe us, and offer great care for your lovely plants with our Celover Watering Stakes! 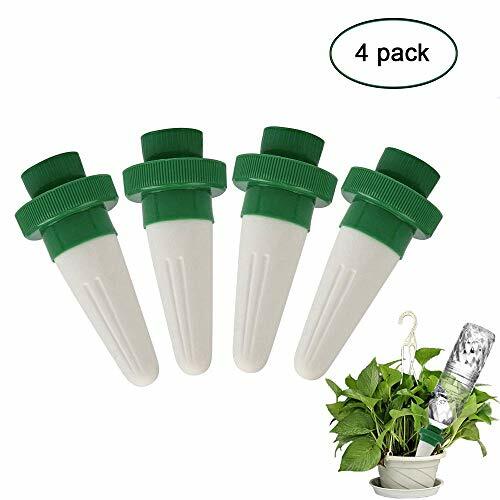 and what you need to do is just fill the water in the bottle, connect the bottle with our stakes and insert stakes into the soil. Garden Helper: Watering your beloved plants used to be a tax. You have to check from now and then and still worry that your treasure may wither. However, with the help of our self plant watering drippers, you can take a rest and save much more money and energy. ✿Flip over the whole body, and insert the watering dripper into the soil. 5. As for the bottle connected to the spikes' mouth, Plastic Rootbeer, and Noyu Tea Bottle are our suggestion. Great Care for your Plants: With our vacation plant watering drippers, you can promote healthier roots and Grow Healthier Plants. Releasing water properly means you won't lose any soil or nutrients. You don't need to worry about your beloved plants while you're on business, holiday, vacation. Optimal Material: Our plant watering spikes, made from high ceramics material, release water gradually, help keep the water cool and moisten the soil. Durable, portable and lightweight, the spikes can be used for many years. It is really the optimal material that can save a lot of money and time. Easy Installation: Just find a bottle to fill water, tighten the cup up to connect the bottle with plant watering drippers, and insert the watering drippers into the soil. Then water will seep out gradually and properly. There is no need to worry that your lovely plants would wilt for lack of water or overwatering. Thoughtful Design of Connectors: The design of the plant watering spikes' connectors is extremely thoughtful; the spikes have two sizes of connectors. The bigger one's diameter is about 1.89 inches and the smaller one's is about 1.1 inches. Therefore any bottle of that diameter can match the spikes. No Risk Purchase: If faulty or malfunctioning watering spikes have been sent, customers can ask for full refund or replacement. If there are any other problems, please free to contact our customer support team. Just have a try and you will find our watering spikes are amazing! If you have any questions about this product by CeLover, contact us by completing and submitting the form below. If you are looking for a specif part number, please include it with your message.